The Seoul Metropolitan Government selected five locations, totaling 2,853,000m2, for the “Seoul Urban Renewal Pilot Project,” through votes collected by district. These are places with fragile living conditions, such as weak infrastructure and safety measures that require urgent urban renewal, including Jangwi 1-dong, Seongbuk-gu, where the New Town restrictions were removed, and the area surrounding Seongsu 1, 2-ga, Seongdong-gu. The “Seoul Urban Renewal Pilot Project” focuses on urban renewal by neighborhood regeneration in order to improve the living conditions for day-to-day life, securing the infrastructure for basic living and thus reinvigorating the local economy. By focusing on urban renewal through neighborhood regeneration, instead of at a larger scale, the Seoul Metropolitan Government aims to realize both the “rejuvenation of old and deteriorated areas” and “reinvigoration of the local economy. “Urban renewal through neighborhood regeneration” differs from an economy-based urban renewal, as the latter focuses on assigning new functions to the city and creating a basis for employment in connection with repairs and developments of industrial complexes or harbors. The Seoul Metropolitan Government announced its selection of locations for the “Seoul Urban Renewal Pilot Project,” in October 2014. A total of 15 projects from 14 districts applied, and five finalists were selected. An assessment committee made up of experts in areas including construction, urban planning, transportation, history and culture, as well as city council members, selected the five areas through ① application screening, ② on-site evaluation, and ③ a final assessment. In particular, the committee focused on the willingness of districts to improve the area and the feasibility of such while assessing the ▴trade off of the pilot project, ▴capacity of the district to carry out the project, ▴ interest and participation of residents, ▴ ripple effect of the project, ▴ and the level of deterioration of the neighborhood. The projects to be led by the five selected districts will begin in 2015. For each location, the Seoul Metropolitan Government will offer 90 percent and districts will offer 10 percent of the estimated cost (within KRW 10 billion). The project funds will be invested in establishing a base so that the area will be sustainably self-rejuvenated and creating a local community. Moreover, the funds will be invested in people-centered, not facility-centered, rejuvenation projects, such as a strengthening of regional capacity, cultural renewal using local assets, reinvigoration of the local economy through creative job creation, and the establishment of a safer and nicer residential environment. The Seoul Metropolitan Government will continue to monitor the entire process of the urban renewal project until its completion. Through consultations, regular city-district joint meetings, and advisory panels, the city government will fully support these urban regeneration projects in connection with local government and resident participation. 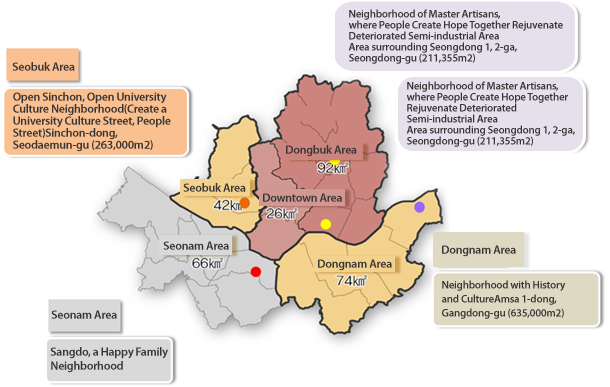 Moreover, the Seoul Metropolitan Government will develop educational programs tailored to the unique characteristics of each selected district to foster neighborhood leaders and activists and reinforce resident ability, which is the key to urban renewal. Training and educational sessions for residents will also be provided to increase resident understanding and participation.